Naomi Black at Google headquarters invited Willie King, Jared Evans, Ben Rubin, Richard Goodrow, me, (and maybe others who couldn’t make it) to a Hangout On Air so she should show JAC Cook how Google’s videoconferencing technology works. We talked about some of the plusses (no pun intended) and minuses of Google+ HOA’s (Hangouts On Air, not Homeowners’ Associations). On the plus side, you have an attractive service and you don’t have to deal with firewalls; on the minus side, it is hard to have group talks in ASL when only one signer is in a big pane and all the others are in “thumbnails” in the “filmstrip” along the bottom of the screen. We discussed ways of moderating multi-signer videoconferences, such as having people hold up their hands when they want to talk and waiting to be called upon. Naomi reminded us you can select the thumbnail of the person you want to watch in the big pane, and a few of us recommended doing away with the screen-and-filmstrip layout and going to a more equally-sized multi-pane layout (or one where you can control the size of panes). Jared Evans & Willie King work at ZVRS and they said they would like to give Google some tips on more effective multi-point videoconferencing for signed language users. 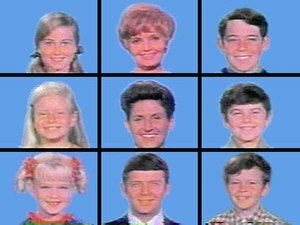 I am glad that Google keeps seeking the opinions of the signing communities; I just hope they are willing to change the layout of Hangouts to a “Brady Bunch” grid format– or at least offer it as an alternate layout. Here is just a sampling of links. Some of these I found on Discover Interpreting, and some of them I found on my own. I just found a page full of links on Omniglot, so I shall give you this list for now, recommend you check out the Omniglot links to websites about signed languages and manual alphabets around the world, and welcome you to post responses with other resources you think should be listed. Is there anything else you think should be listed here? If so, please leave a link in a comment. Why would Deaf people think interpreting is easy? Announced today: YouTube’s enhancements to closed-captioning. I’m glad to hear this! I am a longtime supporter of closed-captioning. I posted my first closed-captioned video on Google Video just after they implemented closed-captioning in 2006. Now YouTube has implemented CC settings that allow viewers to adjust the font, size, color, and background of captions. Even better, YouTube is now supporting older captioning formats so that videos captioned decades ago can now be uploaded along with their original caption files. This means millions more closed-captioned videos will now be viewable on YouTube! Here’s that first closed-captioned video I posted on Google Video— now on YouTube. I’m glad people watching the videos I caption can now adjust the look of the subtitles to their preference. Feel free to fiddle with the CC settings to make the captions look just the way you like.